We aim to support all educators doing soldier biographies in the classroom through the Lest We Forget program. Here, high school educator and Lest We Forget founder Blake Seward talks about the program. This Approaching the Past session, hosted by The Gregg Centre for the Study of War and Society and sponsored by The History Education Network/Histoire et éducation en réseau (THEN/HiER), brings together four history educators from elementary, middle school, high school, and post-secondary classrooms to share and discuss approaches to teaching the First and Second World Wars using soldier bios. The premise of a soldier biography is that learners will create a biographical sketch of a soldier based on primary sources that serve as an entry point to understanding the conflicts in which these soldiers fought. Some participants' biographies are written, while some others choose to compose songs or prepare pieces of theatre. In this video, Dave Sullivan offers one of the most powerful soldier bios we have seen. If you're new to using military service files in the classroom, the Lest We Forget Starting Templates and Supporting Documents page is the best place to start. The Personnel Information and Service Record templates provide an outline of the information students can search for within the file. ​Teachers in the earlier grades can review these templates as a class and have students discuss the difference between personnel information (eye colour, religion, etc.) and service information (unit, regimental number, etc.). Younger students can create their own files with personal information about themselves. ​Have students go through the file with highlighters to identify the personnel information and service information needed to fill out these templates, using different colours for each. This research can also accompany map work, where students find their soldier's hometown, the town where he enlisted, as well as overseas locations they can find in the file. ​​The First World War Information Package is useful for both students and teachers - it provides a comprehensive outline of how to read a First World War military service file, and includes the list of abbreviations that will help students interpret the information in the file. ​In addition to the personnel and service information, it can be helpful to have students highlight the abbreviations in the file that will be unfamiliar to them. This gives students practice doing a close reading of the file, helps them access more information about their soldier, and teaches them about interpreting primary sources. 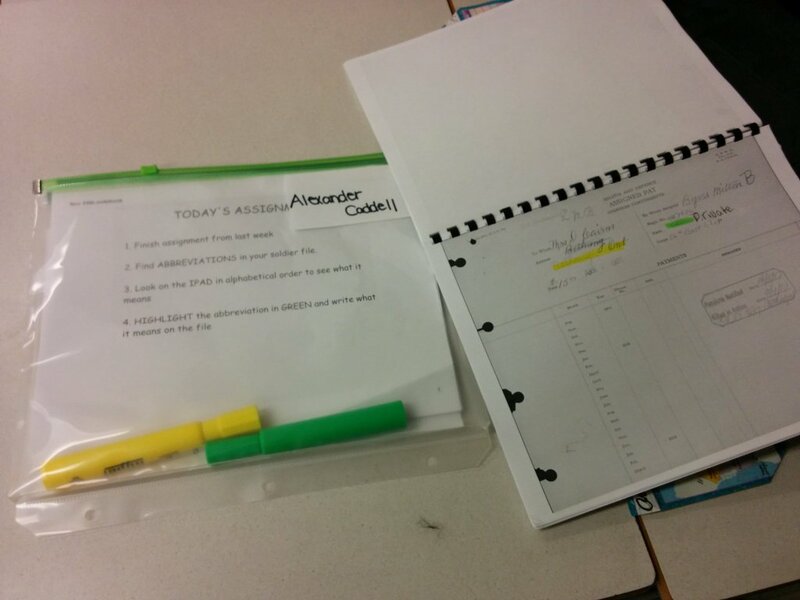 In the photo example above, the teacher of this Grade 4 class put together a portfolio that includes the soldier file, highlighters, printed instructions and the list of abbreviations. This class accessed the list using iPads, but teachers can easily print and copy the abbreviations list to include in the portfolio. Printed maps (or instructions for accessing digital maps if using iPads) can also be included in the portfolio. The Library and Archives Canada First World War diaries search page is where teachers and learners can access digitized war diary entries. Enter the name of the unit, and specific dates if required, to learn more about the experience of your soldier's regiment. This is very useful for understanding their location and what their day-to-day experience was like. Teachers working with beginning and developing readers can use these in a read-aloud. The Library and Archives Canada First World War diaries page for the Battle of Vimy Ridge contains information about the battle, as well as a list of references and links to visit. This is a good site for teachers looking a bit of background information on the battle. The Canadian Letters and Images Project is a database of wartime memoirs, letters, diaries and photographs. If you type Vimy Ridge into the search bar, you will be able to browse documents from soldiers who fought at Vimy Ridge, which can provide students with perspectives on the battle from those who were there. Even if it is not their soldier's words and memories, this can be an effective way for students to learn more about what their soldier's experience might have been like. The Canada's First World War Experience website is a great site to visit for a comprehensive database of sources on all aspects of the First World War. Students can view photos and documents on a number of topics including the home front, the role of women, diversity, and symbols. These themes can connect with many curriculum outcomes. Teachers can develop a classroom album or timeline using photographs that connect with the themes studied. The Canadian War Museum has a collection of primary sources, including photographs and paintings, specifically for teachers teaching about the Battle of Vimy Ridge. These can be dowloaded as a package or accessed directly on the web page. Once you've clicked on the source you wish to view, clicking on the arrow in the lower right corner of the page will bring up an annotation for each of the documents, providing some context for the viewer. 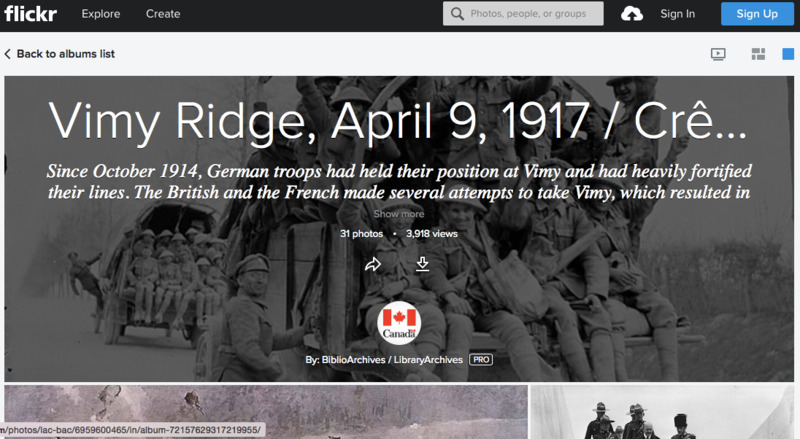 The Library and Archives Canada Vimy Ridge Flickr page is another spot to easily find photographs for teaching the Battle of Vimy Ridge in the classroom. This collection of 31 photos can be viewed as a slideshow or as a photo stream online, and can also be downloaded as a package. This activity focuses on the Vimy National Memorial in France and uses the virtual tour of the memorial site as an entry point for discussion about remembrance. The website suggests that this activity is appropriate for grades 7-12. Teachers looking to adapt this activity for younger students can use the virtual tour to engage students in discussion about memorials and remembrance, and have students compare the Vimy memorial with local memorials. A good activity to encourage some critical thinking for all ages is to have students design their own memorial and explain what elements they included and why.